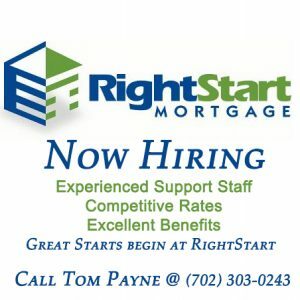 RightStart Mortage is a full service Mortgage Banker, looking for experienced residential mortgage loan originators for our new office in Las Vegas, NV. Ideal candidates will be self-starting, have a positive attitude and experience originating residential mortgage loans. Position requires a current/active NMLS license/endorsement. Excellent working environment for open minded individuals who have the ability to work independently and with a team. We strive to achieve great results by providing world class service. Email for more information or send resume and cover letter. For quicker results call me. If I’m not able to answer you call, leave me a detailed message.